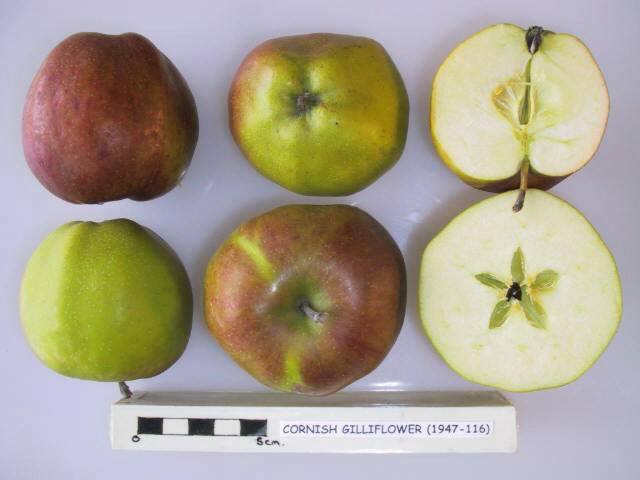 Cornish Gilliflower is probably the best and most widely-grown of the apple varieties originating from Cornwall. It has all the attributes of the classic Victorian English apple - notably a sweet aromatic flavour with perfumed overtones and an attractive flushed appearance. 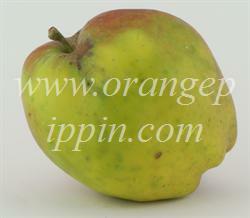 It is acknowledged as one of the best-flavoured English apples. It is also a relatively good keeper, and can be eaten well into the new year. The Victorian author Hogg explained the origin of the word "gilliflower" or "gillyflower" as being a corruption of the French word "girofle" signifying clove - and the blossom of this variety has a clove-like scent. Hogg also recommends growing this variety as an espalier on dwarf rootstock - although modern authorities would not recommend this style because Cornish Gilliflower bears apples on the tips of its branches, making it unsuitable for training in this way. Just tasted my first apple off my Cornish Gilliflower. Wow! I've marked it down to cut lots of scion wood this winter with the aim of top-working a couple of trees over to this variety. A great apple - only downside is - at least in my case - it was a long time (seven years) coming into bearing. Worth the wait though - the flavour is outstanding. We have a Cornish Gillyflower although it looks more russety than in the picture - not a hint of red. Very erratic and biennial bearer, though very delicious apples. They may be keepers but are gorgeous straight off the tree, so we'll probably never know.